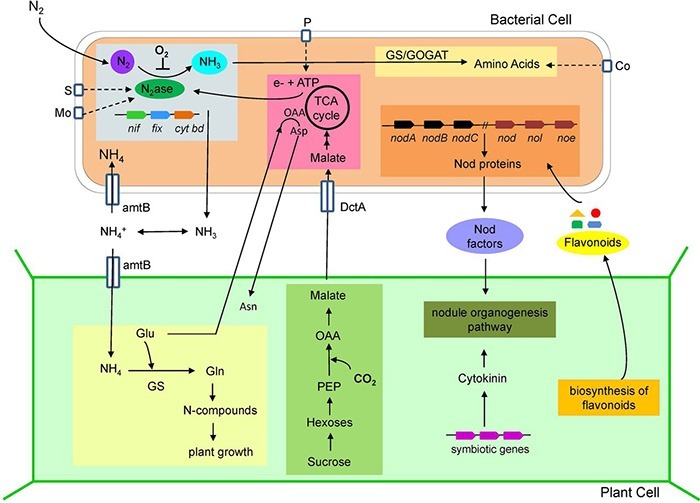 Bacteria are important for their natural roles in the biosphere, for example role in rhizosphere, nodulation, and nitrogen cycling. The region where the soil and roots make contact is called the rhizosphere. The rhizosphere is a complex biological system in which the bacterial population is considerably higher on and around the roots than that of root-free soil. The bacterial growth is enhanced by nutrients released from the plant tissue, for example, amino acids, vitamins, etc. The nodules are swellings in the roots. These are composed of cells that nitrogen-fixing bacteria. The nodules are characteristic of the members of Leguminosae and are built-in source of fixed nitrogen. The bacteria supply the legume with fixed nitrogen, and the plants provide the bacteria with carbohydrates and other organic compounds. Of all mineral elements, nitrogen most often limits the growth of plants and crop yield. The plants require nitrogen synthesis of proteins, nucleic acids and other important organic molecules. However, the plants are unable to absorb gaseous N2. It must first be converted to ammonium (NH4+) or nitrate (NO3–) before the plants can absorb it. 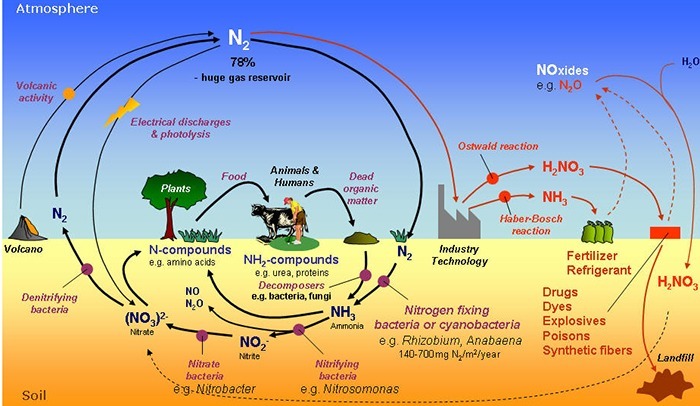 The conversion of molecular nitrogen into ammonia or nitrate is called nitrogen fixation. 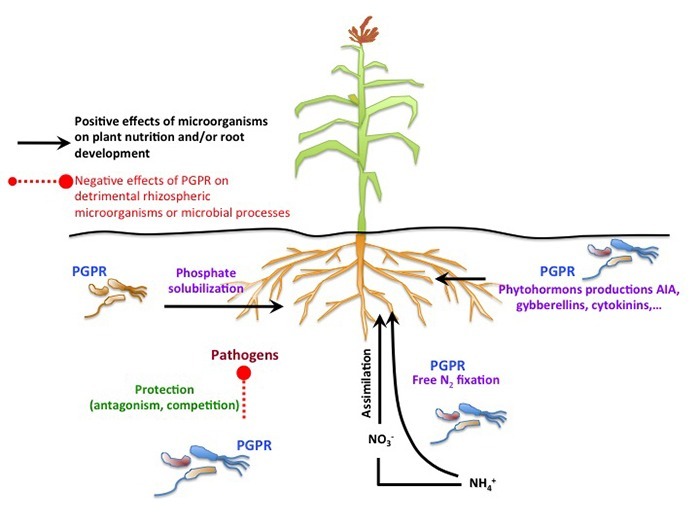 Certain bacteria called nitrogen-fixing bacteria are able to fix nitrogen. These bacteria like Rhizobium leguminosarum may live freely in the soil or associated with roots of the plants. Non-symbiotic Bacteria: These are bacteria that live freely and independently in the soil. The common examples are Clostridium and Azotobacter spp. Symbiotic Bacteria: These are bacteria that live in roots of plants, for example in root nodules of legumes. These include Rhizobium spp. 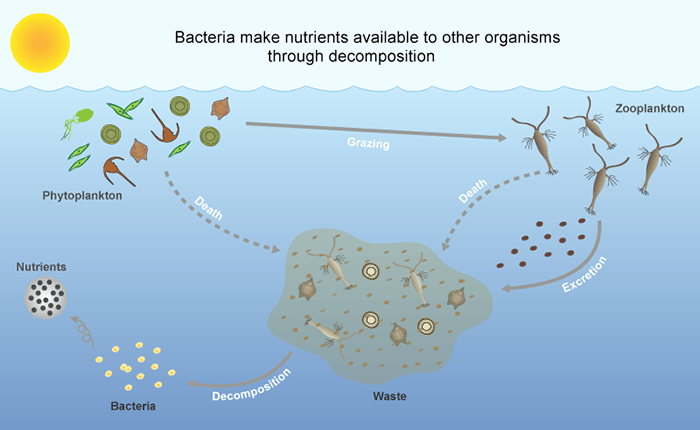 Saprotrophic bacteria along with fungi decompose dead organic matter and form partially decomposed organic matter, the humus. The formation of humus is humification. These are taken up by plants once again to build organic compounds. This is known as nutrient recycling.